So a project fell into my lap the other day, that I was able to expand into a few things that make me really happy. First it started with the fact that a character needed a simple, but opulent wedding outfit. The requirements were white and gold and lace, in the same corset and mermaid skirt silhouette as the character’s other garb. There was already a corset purchased for me to color coordinate with, in a lovely off-white. 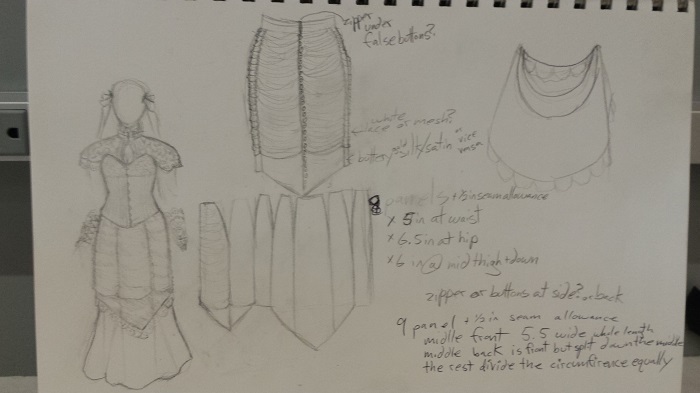 In my initial sketches I came up with the idea of using something like a pencil skirt to tighten up the form fitting nature of the mermaid skirt and pull in some more textures and color to the outfit. Now, I could have probably just bought and modified a pattern, but I was in the right mood to draft up a pattern myself. So I took some detailed measurements and went to town. I’m actually really pleased with how the pattern turned out. It’s a mix of contoured panels, with the middle front and back panels rectangular as focal points. 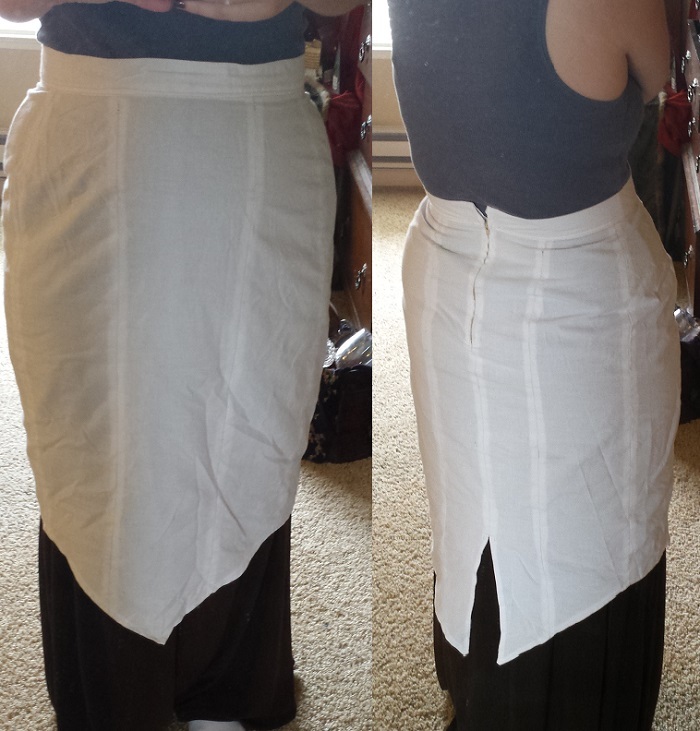 Additionally this is my first time patterning out a fitted skirt instead of a drawstring skirt; there’s just enough ease in it to wear comfortably, and the zipper is entirely necessary for getting into and out of it. 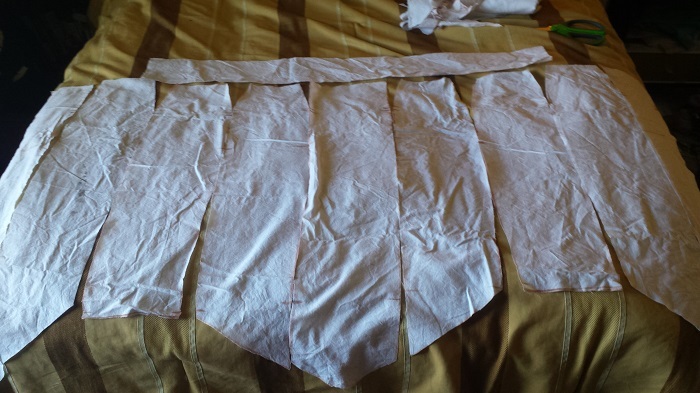 Here’s the pattern in muslin, layed out in order. And here’s the muslin all basted up for fitting. The quirks of this pattern are that I can fold up the angled edges to use it for a basic traditional pencil skirt, or as you see here with the triangular hem. I feel like this angled hem lends the skirt a nice high fantasy feel. The front is reminiscent of some of the more creative tabards I’ve seen, and the split up the back being exaggerated compared to the standard pencil skirt reminds me oddly of coat-tails. After the muslin test I moved on to select the fabrics for the final piece. 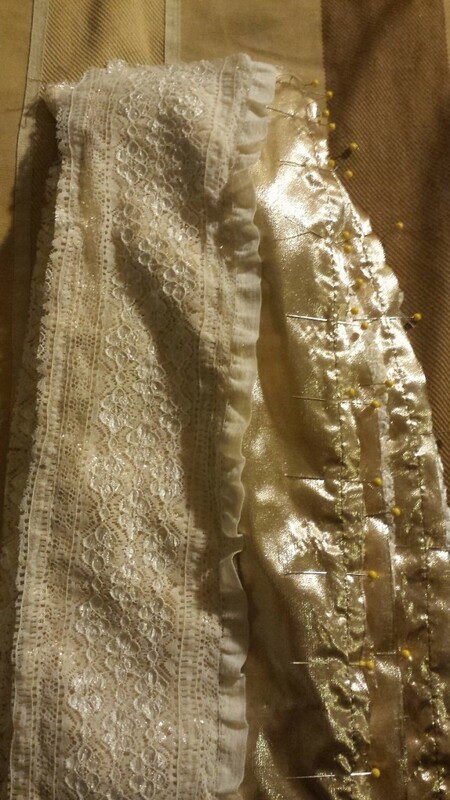 I decided an overlay of white lace over cloth of gold would be an excellent way to work the gold into the outfit subtly. It would look rich, but not like a gaudy carnival costume. I cut out the cloth of gold pieces from the pattern first. 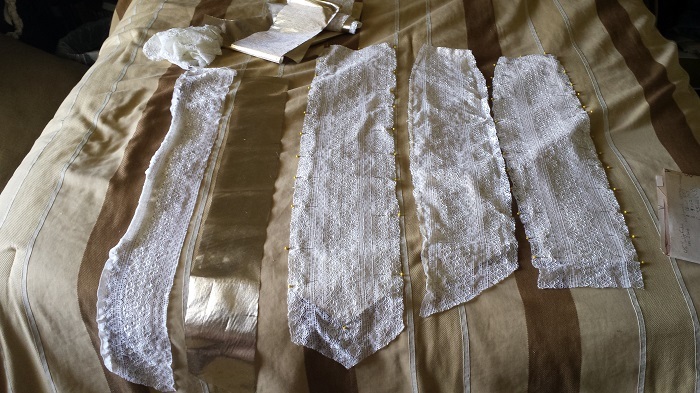 Since the lace was slightly stretchy I used the gold pieces to cut out the lace panels. I was much easier than using the paper pattern I made, as I could get the pins into the gold much easier. The gold was a good stabilizer as it had no stretch at all. 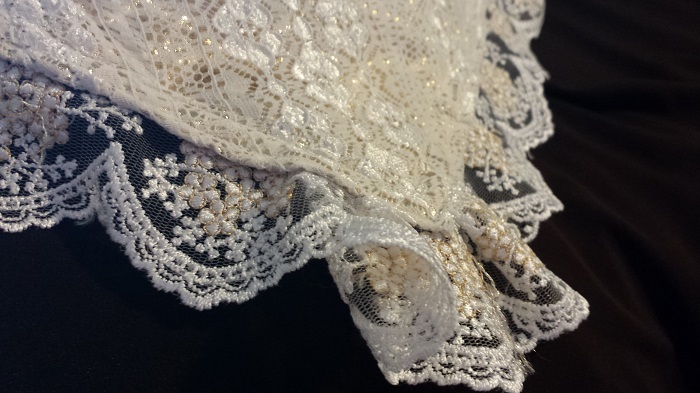 The effect of the gold behind the lace really is very subtle, you can barely see it from a distance. I mentioned that the lace was stretchy. so to avoid distortions between the two layers of the skirt I decided to tack each panel to it’s corresponding under-layer. Here’s a stack of already tacked panels, pinned and waiting to be sewn together. The tacking really helped keep the stretchy lace from snagging up in my machine, and was worth all the extra sew time. I tested sewing two scraps of the lace together without a stabilizer, it was maddening. The other precaution I took, had to do with the loose weave of the gold fabric. 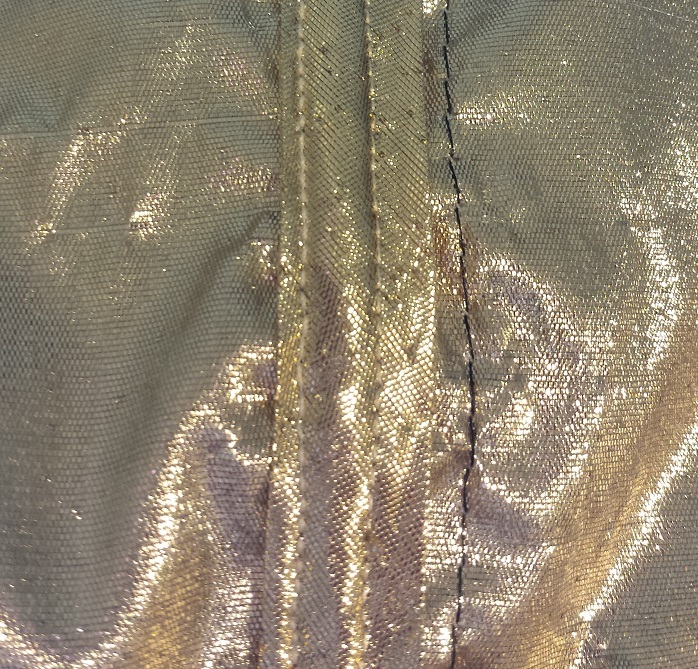 The gold fabric started fraying as soon as I cut the pattern pieces. 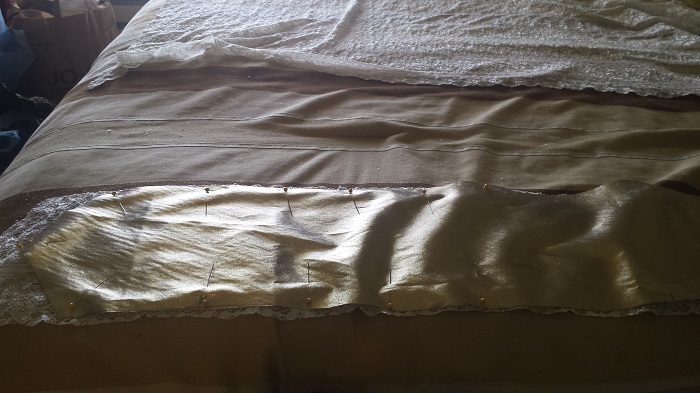 so to increase the longevity and strength of the piece I enclosed all the major seams with bias tape. This process was awkward, and I couldn’t get a good photo of it while it was halfway done, so here’s a close up of the inside of a finished seam. 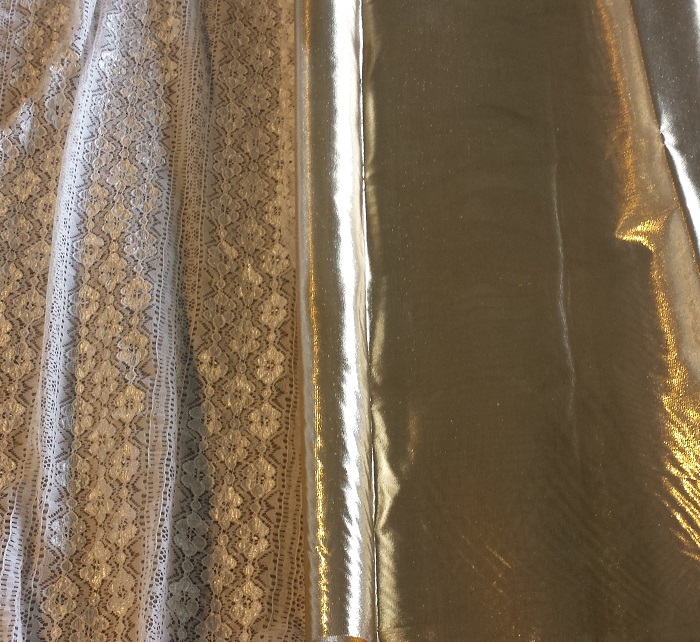 Sadly the waistband that came out so well on the muslin did not work as well in the gold fabric. I’m going to have to do some research and re-draft that part of my pattern. 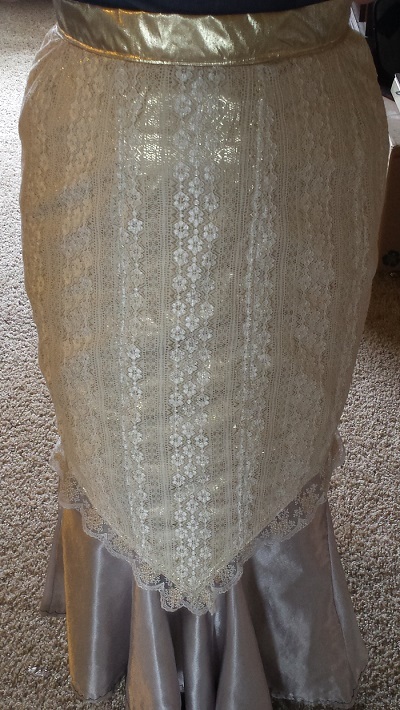 The last thing I added to the skirt was a trim of gold embroidered lace along the hem. this was one of the first times I really wished I had a dress form, and I suspect it will not be the last. The nice thing about this lace is that it is going to be repeated throughout the outfit and act as a unifying element. The finished skirt over one of my drawstring mermaid skirts looks just about perfect. Since finishing this skirt I’ve modified the pattern to also be extended into a fitted mermaid skirt. And will be doing a muslin test of it fairly soon.